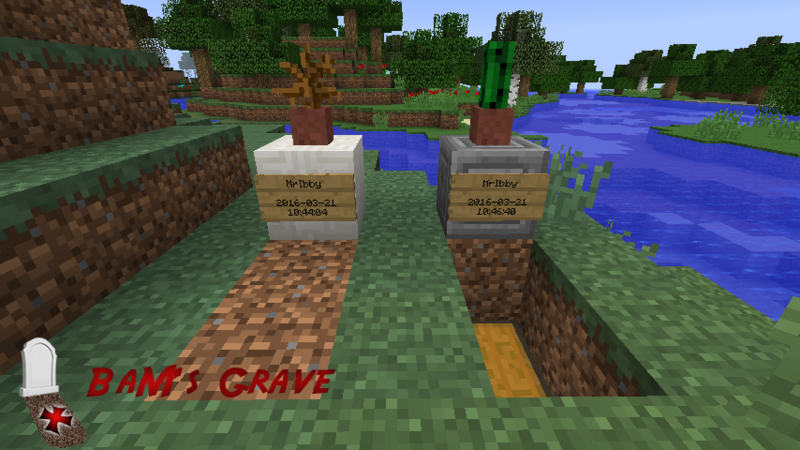 Instead of dropping your inventory on death, a grave will be dug in which lies a buried chest with your inventory and experience. The grave will be inscribed with your name and time of death. This helps to keep your things from getting lost or despawning. All modpack authors are free to use this mod as long as they link the modpack in a comment or PM. What happens if the world has "Keep Inventory" to true? Will it still dig a grave or will you just keep the stuff? - Support for Eydamos Backpacks. If you carry a backpack in the dedicated backpack slot, it is dropped instead of put in the chest. What changed this mod when generating the world? This is a helpful mod, especially since I use the Survivalist Mod as well. Some suggestions for the Config File. True/False questions. That way you can be more selective about how helpful the death chest is. 1. Include Experience in Chest: True/False. 2. Include Items in Chest: True/False. 3. Include Armor in Chest: True/False.